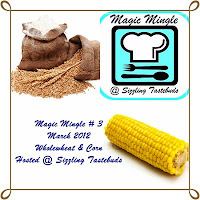 It's Magic Mingle time... And this month we got a very interesting combo.. Whole Wheat & Corn..
1. Mix Atta, Ajwain, Salt, Red Chili Powder in a flat- bottomed bowl. Pour 2 teaspoons of Oil and rub the mixture with both hands. Finally, kneed the dough by adding enough Water. 2. Take 2 small balls from the dough and roll out 2 round chapatiz. Spread boiled Corn over a chapati and sprinkle Salt & Chili Flakes evenly over the corn. Place the second chapati over the corn (Its like Corn sandwiched between 2 chapatiz. Seal the ends by pressing the 2 chapatiz with soft hands ensuring that corn doesnt fall out. Yummy parathas..Agree with the fact that Magic Mingle is bringing out the creative best in us. Very well made lifafas, looks so appetising. i loved the name of this paratha a lot, even the pics look cool. loved the name of the recipe, this sounds so yummy n nice recipe...wonderful preparation...looks tempting!! nice healthy and tasty parathas.